The client application gets an HTTP status code of 404 with the message "Not Found" and the error message as "Unable to identify proxy for host: and url: " as a response to the API calls. This error means that Edge could not find the API Proxy for the specified virtual host and path. The above error message indicates that Edge could not find the API Proxy for the "default" virtual host and "/oauth2/token" path. If the API Proxy is not configured to accept the requests for the specific Virtual Host, then we can get a 404 Not Found response with the error message "Unable to identify proxy for host: and url: ". Move to the Resolution section below to know how to address this issue. 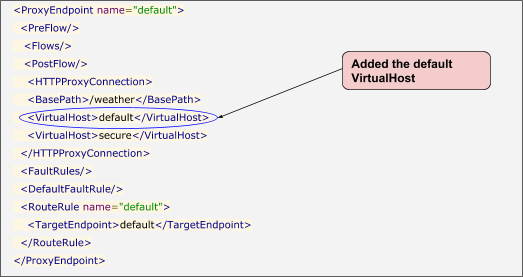 If the Proxy Endpoint is configured to accept the requests on the "default" VirtualHost, move to the next cause - Path not associated with any API Proxy. Add the missing VirtualHost to the Proxy Endpoint configuration to address the issue. If the API Proxy is not configured to accept the requests for the specific path used in the API Request URL, then we can get 404 Not Found response with the error message "Unable to identify proxy for host: and url: ". Look at the Proxy Endpoint configuration for the specific API Proxy for which you intended to make the API requests. If the path indicated in the error message is not same as the basepath of the specific API Proxy and/or it does not start with the basepath, then that could be the cause for the error. API Request URL is https://myorg-prod.apigee.net/climate. This means that path used in the API request URL is /climate. Ensure the path used in your API request URL is same as the basepath of the specific API Proxy. If the path used in the API Request URL starts with the basepath, then it's possible that the path suffix (i.e., the part that comes after the basepath) indicated in the error message does not match any of the conditional flows, then that could cause the 404 error. API Request URL is https://myorg-prod.apigee.net/weather/Delhi. This means that path used in the API request URL is /weather/Delhi. In this example, the path starts with the basepath /weather. In addition, it has path suffix which /Delhi. 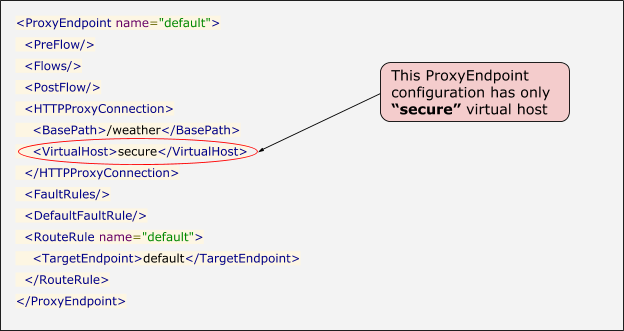 Now check if there are any Conditional flows in the Proxy Endpoint. If there are no Conditional flows or there are a few non Conditional flows, then move to next cause - API Proxy not deployed in an environment. If the conditions in all these Conditional flows check for a specific proxy.pathsuffix (i.e., the path after the basepath). And if the path suffix specified in the API Request URL does not match any of the conditions, then that's the cause for the error. Ensure the path suffix matches at least one of the conditional flows in your proxy endpoint. If the Proxy Endpoint has the correct basepath and the path suffix specified in the API URL does match one of the conditional flows, then move to next cause - API Proxy not deployed in an environment. Determine the environment to which the host alias used in your API request URL exists. This can be done by checking the details of all virtual hosts in each of the environments of your organization in the Edge UI. If http://myorg-prod.apigee.net/weather is your URL, then myorg-prod.apigee.net is the host alias. The host alias myorg-prod.apigee.net is configured as part of one of the virtual host(s) of in "prod" environment of your organization. Check if the specific API Proxy is deployed in the specific environment determined in the step #1 above. If the API Proxy is not deployed in the specific environment, then that's the cause for the 404 error. So in the example used in step #1 above, let's say the API Proxy is not deployed in the"prod" environment, then that's the cause for the error. Move to the Resolution section below. If the API Proxy is deployed in the specific environment, then move to next cause - Environment not loaded on Message Processor(s). Deploy the API Proxy in the specific environment in which you intend to make API requests. If the specific environment is listed as part of the above command, then move to next cause - API Proxy not deployed on one or more Message Processors. If the specific environment is not listed, then check the /opt/apigee/var/log/edge-message-processor/logs/system.log and /opt/apigee/var/log/edge-message-processor/logs/startupruntimeerrors.log on Message Processors for any errors during loading of Environments. There could be many different errors that could lead to failure of loading an environment on the Message Processor. Resolution depends on the error that occurred. The Environment may not be loaded on Message Processor due to many reasons. This section illustrates a couple of possible reasons that can lead to this issue and explains how to resolve the issue. If you see one of the following errors in the Message Processor log, then it is caused due to an issue found with the certificates/keys that have been added to the specified keystore/truststore in the specified environment. The example output shows that there are two certificates and a key in the truststore myTruststore. The truststore generally does not contain a key. If it does, it is better to have a single certificate and a single key. Check the expiry date of each of the certificates and determine the expired/older certificate. Delete the expired or unwanted certificate from the truststore "myTruststore". If the problem still persists or if you see any error other than the ones mentioned in Step #1 above, go to Must Gather Diagnostic Information. The API Proxy may not be deployed on one or more Message Processors. This issue occurs very rarely and happens mostly due to a missing event notification from the Management Server to Message Processor during the deployment of the specific API Proxy. In this case also, you will not be able to create the trace session in the Edge UI. If the specific revision of the API Proxy does not show up as the output of the command mentioned in Step #1 above, then restart the specific Message Processor as explained in the Resolution below. Repeat the steps 1-2 for all the Message Processors. If the specific revision of the API Proxy is deployed on all the Message Processors, then this is not the cause for this issue. Move to Must Gather Diagnostic Information. Restart the specific Message Processor(s) on which the specific revision of the API Proxy is not deployed. Note: The steps in this section can be performed by Public Cloud users only. API Monitoring enables you to isolate problem areas quickly to diagnose error, performance, and latency issues and their source, such as developer apps, API proxies, backend targets, or the API platform. Step through a sample scenario that demonstrates how to troubleshoot issues with your APIs using API Monitoring. For example, you may want to set up an alert to be notified when the number of 404 status codes exceeds a particular threshold. If the problem persists even after following the above instructions, please gather the following diagnostic information. Contact and share this information with Apigee Support. Output of the following commands on each of the Message Processors. Details about what sections in this Playbook you have tried and any other insights that will help us to fastrack resolution of this issue.